LABYRINTH BOOKS Toronto Comics MANGA and GRAPHIC NOVELS - TORONTO: NEW BOOKS ARRIVING WED OCT 2nd!!! NEW BOOKS ARRIVING WED OCT 2nd!!! - The 5th volume of Digital Painting Techniques is already available in store for those looking for more great digital art tips and techniques! - The 42nd issue of Illustration Magazine arrives this week featuring Cooper Studio's Jow Bowler & children's book illustrator Ted Lewin. - Animation students and fans ought to check out 'The Noble Approach' featuring the retro art design of Maurice Noble! Now available in store! - UDON brings us a tribute book for World of Warcraft featuring the work of hundreds of artists from aroundn the world paying homage to the most popular MMORPG of all time! Check it out this Wednesday! - Check out the first issue Special for All-New X-Men featuring crossovers with the Indestructible Hulk & the Superior Spider-Man! - A new mini-series begins with the first issue of 'Captain America Living Legend' with Steve Rodgers caught between two global superpowers on the brink of war when an unknown alien force taakes out an orbital research station! - The X-Men's international superthief gets his own mini-series! Check out the first issue of 'Fantomex MAX' this week! - DC's villian's takeover continues in the second issue of 'Forever Evil' with the Teen Titans trying to do what even the adults could not! - When the world ends, the remnants of humankind finds themselves facing the returning creatures of myth and legend, the 'Hinterkind' whose hatred for them burns fiercely! Enter this new world when the first issue arrives this Wednesday! - We go back to the original Amazing Spider-Man taking on the universe's deadliest villians in a new mini-series 'Marvel Knights Spider-Man'! THe first issue arrives in store this week! - The greatest pulp hero returns! The Shadow emerges in a new era - modern New York! Drop in when the first issue of 'Shadow Now' arrives this Wednesday! - Check out the first issue of a new anthology by the best artists and writers of Vertigo tackling covens and witchcraft! The first issue of 'The Witching Hour' flies in this week! - The final volume of the 20-year running series 'Battle Angel Alita' arrives this week, concluding with Last Order Volume 18! - Discover the truth behind the Brothers Grimm and their tales when their descendent stumbles across a manuscript that brings him in contact with mystical demons with a claim to his life, and also Cinderella was a guy? Discover the madness in a new series 'Dictatorial Grimoire Cinderella' when volume 1 arrives this Wednesday! - Hello Kitty gets her first ever comic book adventure! See what she's up to in 'Hello Kitty Here We Go'! - 4-panel comic strips featuring the Pokemon Black & White characters are collected in a neat pocket book including stats, trivia, puzzles & quizzes! Drop by to pick it up this Wednesday! - Despair, sin and self image. These are the themes explored in a psychological tale of a sick woman who is literally dying from them. Can a cure be found? Find out in the first part of 'Sickness Unto Death', available this week! - The complete 1st 16 issue series of the 10th Doctor plus the 2010 annual are collected in an oversized hardcover! Fans of Dr. Who can finally grab the whole series 1 HC when it arrives this week! - The softcover version of the FABLES one-off 'Werewolves of the Heartland' will be available this Wednesday! - Grant Morrison & Frank Quitely's 'JLA Earth 2' series is collected in a deluze hardcover edition with a gallery of never-before-seen preliminary art plus more! - The first volume of Mike Carey's new super-hero deconstruction series 'Suicide Risk' arrives this week! - Adventure Time fans will want to get their hands on the new plush of favorite character Princess Bubblegum! - Two new DC statues are in of Arkham City's Batman, and the lovely Comics Cover Girl Supergirl! - New mini box figures for 'Big Bang Theory' will be available this Wednesday! 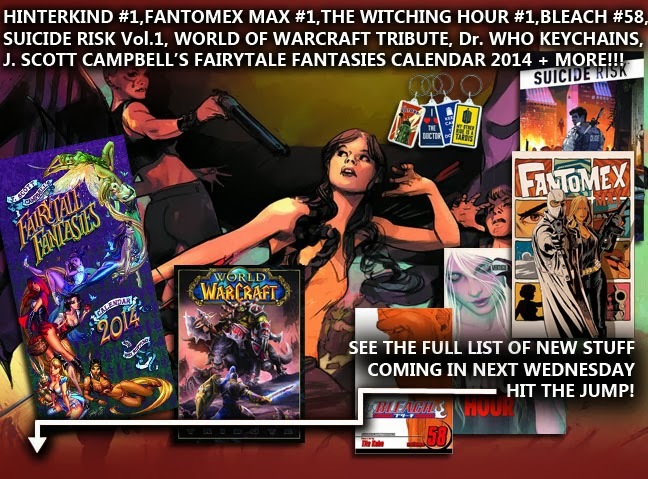 - Our anticipated item for this week is the 2014 calendar featuring the Fairytale pin-ups of J. Scott Campbell! Finally arriving this week! - Mass Effect's Normandy replica returns in store!